I let my mortgage holder pay my home owner's insurance and property tax. I'm sure I could do it myself now since I have plenty of equity but since I hope that my mortgage is gone in a little over a year, I let the bank take care of it. Because they take care of it, I don't keep track of my property tax or insurance. Sure, I look at it once a year around tax time, but other than that I don't think about it. That is until the bank sends me one of those nice letters that says my escrow account is too low. Then they offer remedies like, if I pay $300 up front then my mortgage will only go up $20 a month. If I don't want to pay, my mortgage will go up $50 a month. For the past 4 years my monthly mortgage payment has gone up because of my escrow account. Today I received a check from Chase Bank. No explanation, just a check. 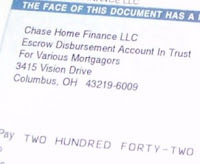 In the address, in tiny print, is says Escrow Disbursement Account In Trust. Hmmm, could it be that since housing values have fallen, property taxes are finally coming down a little so they don't need to hold as much of my money hostage as they usually do? I am guessing that is the case. Finally, this is the first year that they didn't ask for an extra lump sum for the escrow account and raise my monthly payment. I think I will deposit this $240 but I won't spend it just yet. Who knows, they might find some other reason to ask me for money. Now I will be ready for them with my own little escrow account. Pleasant surprise. I also used to get one of those escrow adjustments/raise your monthly payments every year. Also, the first year after I paid off the mortgage, my insurance company still sent the bill to the bank. They no longer had a mortgage or escrow account with me, so I guess they just threw it away or something with no contact to me about it. Luckily I remembered in time because my car insurance is with the same company and I did get that bill. Since then they have sent me the bills directly, but it wasn't as clean a process as I thought it would have been. I have liked Grange other than that which really wasn't their fault but more of the mortgage company's. I don't think they are the cheapest, but the local agents are really responsive and they seem like a good company that does a lot of community service work. Farm Bureau is the cheapest around here for insurance, but they tend to low ball claims from what I have heard. 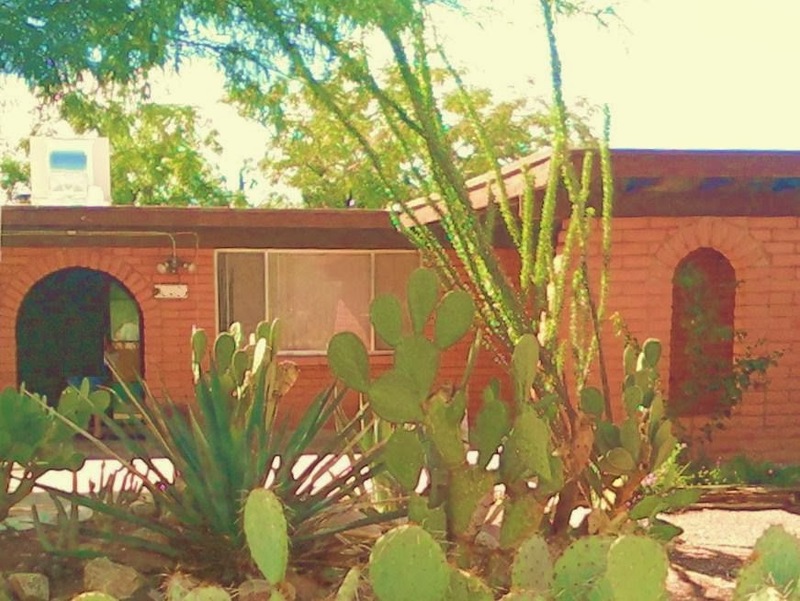 Yes, your escrow disbursement is due to having more money in there than needed. My property tax assessment is $420 less this year. I am looking forward to my escrow refund, which I will use to make a little chip in my mortgage. That is nice to recieve. We get a bill for about $65 each year to cover unpaid insurance. Luckily, its never gone up. Money Funk, you are lucky your mortgage never went up because of escrow. That was one surprise that no one warned me about when I bought my house. The check today was a very nice surprise. So many things to spend it on, I can't decide.